As some of you are already aware, cable providers now consider curling clubs in Québec and across all of Canada akin to “Sports Bar” establishments, based on their liquor permits. This new approach will significantly impact the pricing brackets of cable providers; the updated pricing of sports bundles could have amounted to monthly costs between $400 and $750, based on a curling club’s reported seating capacity. During the past 12 months, Curling Canada, Curling Québec, and all the member provinces and territories, alongside affiliated curling clubs, mounted a fierce campaign that included multiple negotiations and discussions with the country’s major cable providers. As a result of these lobbying efforts, the two primary providers in Québec (Bell and Vidéotron) have agreed to consider all curling clubs within the lowest pricing bracket, regardless of their seating capacity, thus significantly reducing the bundle costs. Additionally, the new pricing structure has been in place in the rest of Canada for a year already, while Québec was spared the changes until summer 2018. 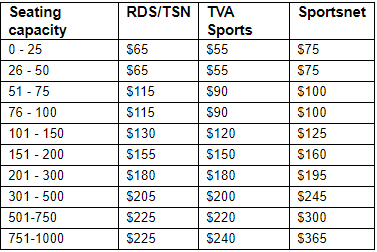 Below are the updated rates as confirmed by Bell and Vidéotron. How can you reduce your expenses? Contact your cable provider directly and ask which options are available to your club. Certain regional offers might be in effect. Both providers remain open to negotiation, particularly if your club is willing to consider multi-year contracts, for example. You can pause your subscription during the summer months, once your curling club closes for the off-season, and have it reactivated once doors open again in the fall. Evaluate your club’s needs. Are all sports channels needed? Perhaps you can rely on one or two only. Please do not hesitate to contact the Curling Québec team should you require additional information or if you have any questions pertaining to this matter.